In week 16 of the 2016 NFL season, the Cleveland Browns were able to avoid going into the history books as only the second team to finish the season 0-16. They claimed their first and only win of the season after San Diego missed a last-second field goal. While they came very close to going winless, the statistics paint a very different picture of the odds of that occurrence. Using the Vegas spread to calculate the probability of the Browns winning each of their games, I created a Monte Carlo simulation to simulate the Browns season 100,000 times. This was similar to the process I used to simulate Alabama’s season before the college football season. 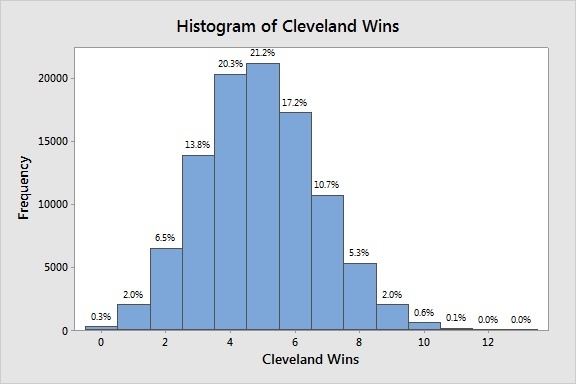 With the simulations complete, I created a histogram that showed the likelihood of different win totals for the Browns season. Based on the Vegas spreads, there was only a 0.3% chance that the Browns would go 0-16. The most likely result was 4 or 5 wins. Now, you might be thinking that it took Vegas a few games to realize how bad the Browns really were. So maybe early in the season the spreads overestimated the Browns' chances of winning, making the probability of a loss much lower than it should have been. We can examine this by splitting the Browns season in two, and looking at the probability of them going winless in each half. 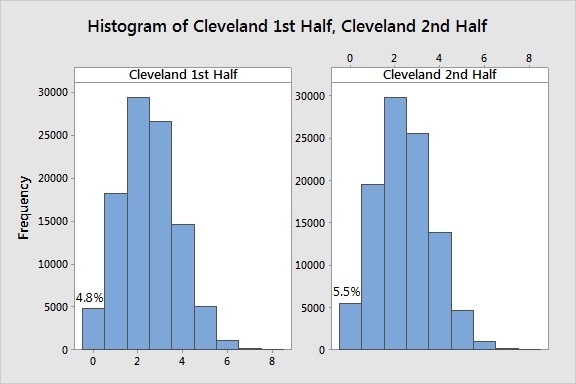 The two histograms look similar for each half of Cleveland’s season. They did have a higher probability of going winless in the second half of the season, but not by much. And the Browns were double-digit underdogs 3 times in their first 8 games, and only one time in the last 8 games. I think it’s safe to say Las Vegas knew the Browns were pretty bad the entire season. But no matter how bad you may be, if you still have NFL players that are doing all they can to win, the stats only say one thing. It’s really hard to lose them all.